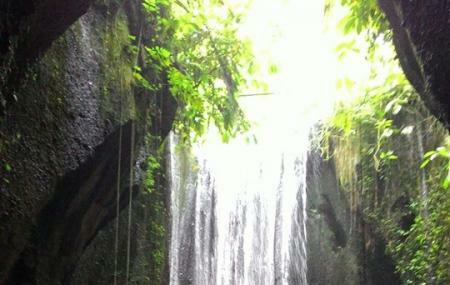 Tukad Cepung Waterfall is one of the lesser known gems in Bali. Also known as Best Virgin Waterfall, the place is maintained and taken care of by the people of Bali. Although free to enter, the functioning of the place totally depends on the donation and charity. The thing that makes this waterfall different from others is the circular shaped cliffs surround it. This gives it a beautiful edge making it a destination to witness nature as its rawest form. Come if you love nature or looking for some quiet time. A few moments here can really rejuvenate you! Also, visit the popular attractions in the city by following Bali itinerary 4 days. Keep lots of food and water with you. Keep some spare clothes too. A donation of Rp. 10000 at the car park is expected for those who maintain this area. Drive to the car park. Walk down the stairs to the river. Follow the river to the cave. How popular is Tukad Cepung Waterfall? People normally club together Campuhan Ridge Walk and Tirta Empul while planning their visit to Tukad Cepung Waterfall. People also prefer to start their day with Tukad Cepung Waterfall. What an amazing hidden treasure. Not too difficult to get to, but definitely a struggle to walk back up those stairs. 😆 Beautiful waterfall, perfect place to take pictures and be apart of nature. Do stop at the top of the stairs and rest while drinking coconut water. Just awesome, nature at it's best. You have to go down and down and down from the hill, then have go inside the cave to discover the beauty of the nature. You will love the sound of the flowing water and it creates magic. Awesome place to visit, should not miss this place. Great view, beautiful waterfall.. Very good to explore the nature Recommended place to visit if you coming to Bali.. Especially when you want to explore not only sea or beach, but also you can explore waterfall in Bali. You can take good photos for your content in social media accounts. MUST DO!!!! It is a easy drive and a 15 min walk down. Such a little river you follow but once you are down it turns into a magical place. At the entrance a beautifull rock with the sun coming through a hole in such an amazing way and then the waterfalls. Big wall in a beautifull mini canyon. Loved them!